BECAUSE FABULOUS DOESN’T FABRICATE ITSELF, GIRLFRIENDS, I’M HERE TO HELP. Because that’s where I am now, and I’m living it and loving it. But it wasn’t always so. Just a few short years ago, I found myself in my late fifties facing a future of loneliness, infirmity, and pain—single, in a job from hell, and battling emotional issues that left me unhealthy, unattractive, and in despair. The only men on my sofa were Ben and Jerry! With time goosing me with “it’s now or never,” I plunged into my makeover, a journey of emotional, physical and sexual healing; then, after decades away from it, the world of dating, with its mind-blowing contemporary dynamics. Over the past few years I’ve shared my transformation and adventures with my quarter million Facebook followers; now it’s time for me to get up close and personal with you, personally coaching you. That’s why I’ve created my Twelve Step Program. That’s right, it's time to kick your addictions! Just say “No!” to toxic thoughts, emotions, and behaviors, replacing them with addictions to all things positive! Become the Fabulous Goddess you were born to be. At any age! You’ll rethink, revitalize and revolutionize your life. You’ll learn how to identify the issues and obstacles that hold you back, how to love yourself unconditionally, and how to access and celebrate your femininity. I’ll help you to develop confidence, create boundaries, use your talents in work you love, and attract what you want. And, of course, I’ll teach you how to maximize your beauty, radiate glamour, exude sexiness, and attract romance. ​CREATE YOUR LIFE A LA HOT TODAY! Note: If you don’t think your happiness is worth investing in, then please move on. Because I haven’t the time, energy or desire to invest myself in you. I want to share my teachings only with those Goddesses committed to being--and having--the best in life. Women like me. 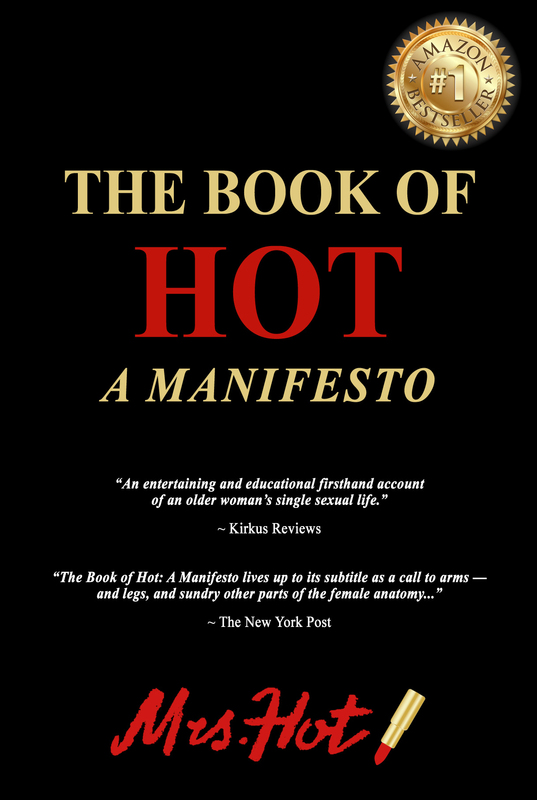 BUY A PROGRAM AND MY GIFT TO YOU IS A COPY OF THE BOOK OF HOT: A MANIFESTO INSCRIBED PERSONALLY BY ME TO YOU! See you in your fabulous future, Goddess! ALL SHARE THE LOVE SESSIONS ARE CURRENTLY SOLD OUT. CHECK BACK OR CONTACT US FOR NEXT SESSIONS. Move your mojo, and spring into Spring! Join me for twelve 90-minute webinars, twice monthly over 6 months. Groups forming now. Select your starting date: Tuesdays at 11:00AM starting April 23 or 30; Wednesdays at 11:00AM, starting April 24 or May 1; or Thursdays at 11:00 AM, starting April 25 or May 2. Join me for twelve personal 60-minute video conferences, twice monthly over 6 months. Homework will be assigned. We'll schedule a mutually agreeable time. Join me for twelve personal 60-minute video conferences, once a week over 3 months. Homework will be assigned. Accountability will be enforced. Daily email communication. We'll schedule a mutually agreeable time. Join me for a 60-Minute Session, no commitment (except the one you make to yourself!) We'll schedule a mutually agreeable time.